Pros: The unique format, which combines gaming and immersive theatre, gives everyone a chance to get stuck in and kick some Nazi arse. Cons: This is not the kind of immersive theatre where you can just hang back and tag along, so if you’re not up for getting actively involved, this one’s not for you. 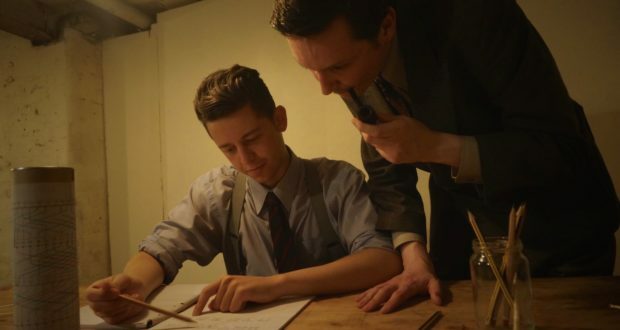 The gripping mixture of DIY codebreaking and historical events is educational, emotional and entertaining. For the first part of the evening, the audience is split into smaller groups, each assigned to their own hut and accompanying assignment. 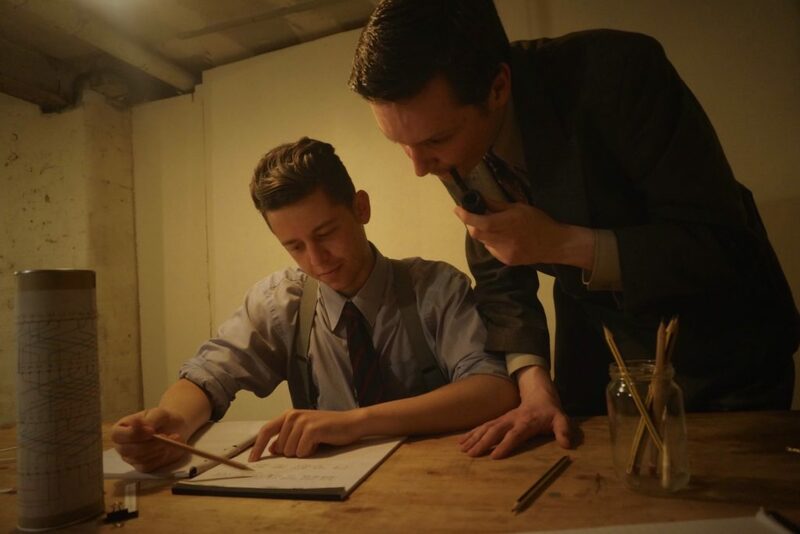 In Hut 6, our little team was given a quick but effective summary of the workings of the infamous Enigma machine by an affable duo of mathematical geniuses: keen bean Keith Batey (Gabriel Burns) and ‘butter wouldn’t melt’ Gordon Welchman (Tom Black). There’s not much time for faffing about, though (there’s a war on you know), so we were quickly put to work in matching up and deciphering messages. Since each hut has their own assignment, we didn’t really know what the other teams were up to, although other characters and audience members sometimes came bursting in with bits of new information. It was exciting and fun, and when after 45 minutes or so everyone assembled to successfully put together our individual pieces of the puzzle, there was a real sense of achievement in the air. After all, you don’t get to stick it to the Nazis every day. 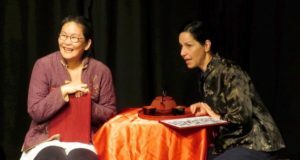 Part two is your more ‘conventional’ immersive theatre: the characters move around the space going about their business, while the audience members tag along to see the action unfold. This section of the show deals with some of the historical events that happened at Bletchley, particularly focusing on attempts to keep Turing’s homosexuality – illegal at the time – under wraps. Hot on the heels of all of the codebreaking excitement, the unexpected turn to serious business is sobering and emotional, particularly due to terrific performances from Edward Cartwright as Turing and Amelia Stephenson as his fiancée Joan Clarke. 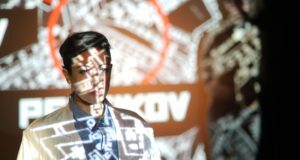 Mechanical Thought’s mix of gaming and immersive theatre is a fantastic find: the two formats blend together pretty much seamlessly, and the constraints that the interactive element places on audience numbers means that the second part of the show goes by without having to elbow your way through crowds of people. The only downside to this approach shows in the evening’s more intimate moments. In a ‘normal’ promenade show, the mutual consensus tends to be that audience members are invisible. In this set up the characters are aware of our presence, which means that, for example, sitting right next to Alan and Joan while they’re trying to resolve their relationship issues, is incredibly awkward. That being said, it’s a small price to pay for actually being quite so immersed in the action. Every aspect of Illicit Signals: Bletchley is thought-through, from the format right down to the smallest details of the elaborately decorated set. The cast are brilliant, and having the opportunity to roam around the set and talk to the actors after the end of the show is a lovely touch. 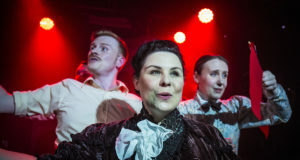 Whether you like immersive theatre, are curious about codebreaking or just want to try something different for a night out (or all three), this show absolutely delivers. See it now or miss out on something amazing.